This past Friday evening my wife and I, accompanied by four close friends, attended the annual Christmas show at Houston's Radio Music Theatre. For those of you who have never had the opportunity to see "A Fertle Holiday" you must stop whatever you are doing and make reservations immediately. This Christmas show is a perennial classic, and with tickets priced at a mere twenty bucks you'll have more fun than the law usually allows. 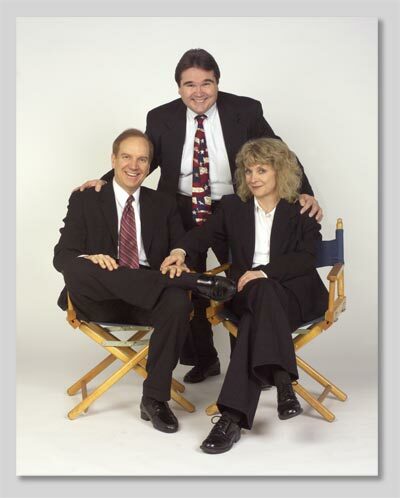 Radio Music Theatre consists of Steve Farrell, Vicki Farrell and Rich Mills. These fabulously talented comedians not only portray multiple roles, they ingeniously incorporate musical interludes and satirical songs that make RMT truly unique. Together, they constitute the funniest comedic trifecta since the Nairobi Trio. Sorry Charlie, but if you like GREATER TUNA you will absolutely love Radio Music Theatre. Steve Farrell is credited with writing all of RMT's comedy and music. His "Nails Are Glue" routine is the most hilarious comedy bit since "Who's On First." And his Doc Moore character joins Ralph Kramden and Clem Kadiddlehopper as among the most endearing audience favorites of all time. Thanks to Steve's fertile mind you will be introduced to the world of scalloped corn, cold butter pie, a performance of Fiddler on the Roof's Tevye that is, in a word, "alarming," and a Duran Duran reference that will keep you howling for days. Clearly RMT's routines are anything but routine. Rich Mills is the funniest guy this side of Jonathan Winters. Rich's "human antenna" bit is brilliant, and when it comes to subtle but hilarious facial expressions Mr. Mills is one-of-a-kind. According to the RMT program Rich recently started a custom website design service; the internet may never be the same. Of course, any successful comedy team must have an exceptional straight man. Or woman. George Burns had Gracie. Abbot had Costello. Lucy had Desi. The Fertle Family has Vickie Farrell. Do not misunderstand -- Vicki stands tall as a comedienne in her own right with a range that rivals Lucy Arnaz. Yet it should also be noted that much of RMT's humor works directly off Vicki. Without her and her delicious characters I fear the Fertles would fall flat. To paraphrase Lucy Van Pelt from A CHARLIE BROWN CHRISTMAS: "Vicki Ferrell, of all the Fertles you are the Fertlest of all." To learn more about Radio Music Theatre I invite you to go to their website at (appropriately) www.radiomusictheatre.com. I have been going to RMT for about eight years now and I have to say that I fully agree with you. While I loved "A Fertle Holiday", some of my other favorites include(Fertle Family of course, but "Hotter Than Houston" is funny as well, gah, anyways) "Weiner Day At The Roller Arcade", "Shut Up and Drive", and "Whatshisname?" I'm actually getting ready to see their next show "Lou Tells a Big One" for my birthday in Feburary, you should check it out. I believe you summed up all three nicely, and yes, nails infact ARE glue! (I so want that tee shirt.) Lou is one of my favorite characters, along with Doc Moore of course. I loved the Red Skellington comparison, how right you are! By the way, I actually came across your artical looking for the lyrics to "Boomtown" (You know, that fabulous song played st the beginning of each show.) But no such luck, oh well, I still have it as my ringtone. Anyhow, I hope you have a great rest of the week, and keep up the excellent writing, it was so much fun to read! Thank you for writing to us. Unfortunately, we don't know how to access the words to "Boomtown" either; maybe you can ask Steve or Vicki for them in February. We hope you will continue to check back here for other postings in the future. We also want to invite you to our website -- www.needtovent.com. The difference between the two is that the website is 100% reviews while the blog will occasionally tackle other topics. These are usually things that really bother us -- hence our NEED TO VENT! In any event, here's a early "Happy Birthday" wish to you. We know you'll enjoy the new show at RMT. Thanks a lot yall, I will definitley check out your other website. Perhaps I WILL ask Vicki or Steve for the "Boomtown" lyrics, I never really thought of that, yall are so smart lol.